This Captivating Bass Lake Lakefront Home Is located in the Exclusive Willow Cove area at one of the â€œWestâ€™s Best Lakesâ€ (Sunset Magazine). Just 14 miles from Yosemite and 2.5 hours from Silicon Valley. Custom accents adorn every room of this stunning remodel. Amazing lake views from every window, deck, and patio! Vaulted ceilings and architecturally designed inside and out to complement the outdoor surrounding mountains and lake views. 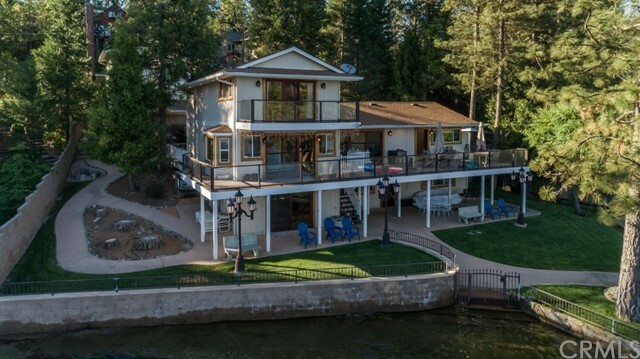 There is an incredible wine room and great room opening into thThis Captivating Bass Lake Lakefront Home Is located in the Exclusive Willow Cove area at one of the â€œWestâ€™s Best Lakesâ€ (Sunset Magazine). Just 14 miles from Yosemite and 2.5 hours from Silicon Valley. Custom accents adorn every room of this stunning remodel. Amazing lake views from every window, deck, and patio! Vaulted ceilings and architecturally designed inside and out to complement the outdoor surrounding mountains and lake views. There is an incredible wine room and great room opening into the dining room. The gourmet kitchen is fully equipped with high quality amenities, Granite counter tops, two sinks, six-burner stove top range, ice machine, two refrigerators and commercial grade Stainless Steel appliances. Large bonus room on the lake level with a wet bar for entertaining, a fireplace, and sliding glass door leading out to a beautiful gazebo and green lawns that are fenced. There are two garages, for golf carts and recreational vehicles plus extra parking spaces. This estate is situated on a large lot that juts out into Willow Cove. The great private boat dock accommodates six boats and there is a beautiful private beach area too!